You will love this pattern. 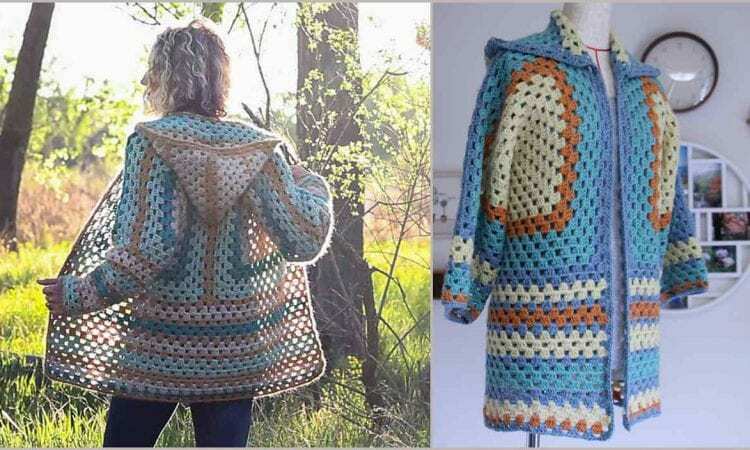 This quick cardigan, which can be easily customized to fit your body perfectly, is made of 2 simple granny hexagons. Its light and airy texture will play well with different color schemes, and if you vary the yarn weight you will be able to ensure its preferred warmth. This is a great project for a garment that will be a hit at any campfire or backyard barbecue, while at the same time not requiring much effort, as it’s made of two granny hexagons. Visit pattern site of The Campfire Cardigan. More info about projects from photos you can find here and here. I have been searching for the free campfire cardigan (children’s size) and I can not find it. Any suggestions? My granddaughter would love it. AThank you.